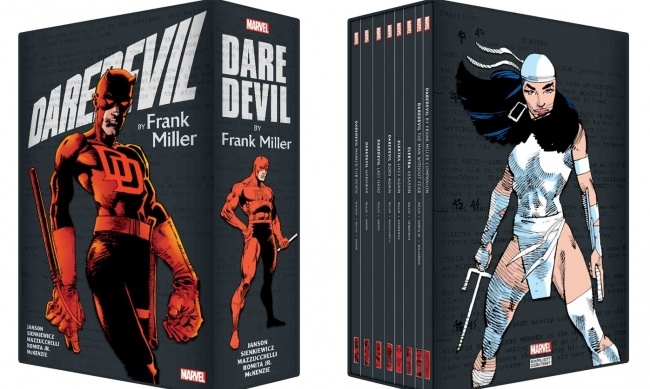 Marvel Comics will gather Frank Miller’s epic run on Daredevil as an eight-volume box set on October 2. The complete saga of Matt Murdock and his first love, assassin Elektra Natchios, is gathered in one collection. Miller established many aspects that became cannon for The Man Without Fear’s world, including character Stick, the Hand, and Kingpin and Bullseye as Daredevil’s deadliest enemies. The eight-volume, 1896-page box set comes with a special poster and has an MSRP of $250.00. Daredevil: Marked for Death TPB (New Printing, Slipcase Edition) collecting Peter Parker, The Spectacular Spider-Man (1976) #27-28 and Daredevil (1964) #158-161 and #163-167. 216 Pgs. Daredevil: Gangwar TPB (New Printing, Slipcase Edition) collecting Daredevil (1964) #168-180. 296 Pgs. Daredevil: Last Hand TPB (Slipcase Edition) collecting Daredevil (1964) #181-191. 288 Pgs. Daredevil: Born Again TPB (New Printing, Slipcase Edition) collecting Daredevil (1964) #219 and #226-233. 224 Pgs. Elektra Lives Again TPB (New Printing, Slipcase Edition) collecting Marvel Graphic Novel: Daredevil — Love and War, Elektra Lives Again, plus material from Bizarre Adventures #28 and What If? (1977) #28 and #35. 192 Pgs. Elektra: Assassin TPB (New Printing, Slipcase Edition) collecting Elektra: Assassin #1-8. 264 Pgs. Daredevil: The Man Without Fear TPB (New Printing, Slipcase Edition) collecting Daredevil: The Man Without Fear #1-5. 152 Pgs. 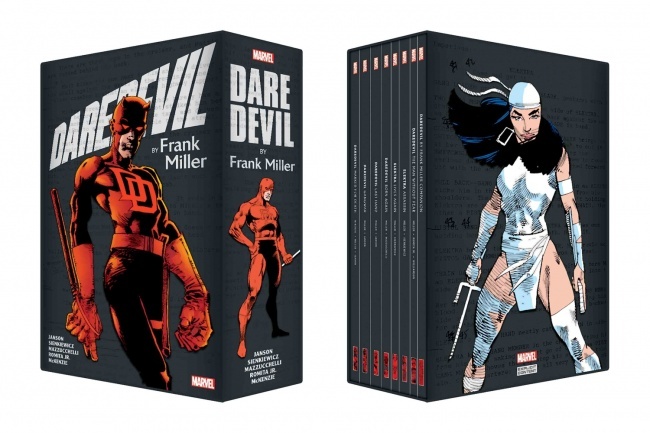 Daredevil by Frank Miller Companion TPB (Slipcase Edition) 264 Pgs.